Although not looking for Mellower Coffee, I’d knew the name, having failed to find one of its branches earlier that week (it had closed last year, a common-enough tale in Shanghai). Therefore, it immediately had my attention when I spied it through the window. Located at the back of the lobby of Tower 1, one of a pair of high-rises flanking the Century Link Mall, it’s on the Century Avenue side, with access direct from the street, the lobby and the mall. Arriving by Metro, exit 7 (street level) deposits you directly outside Mellower Coffee, where a handy door leads into the back of the counter. From the mall, follow signs for Tower 1 lobby, where you’ll find Mellower immediately behind you on the left. Finally, entering via the front of Tower 1 on Weifang Road, Mellower is on the right-hand side, past the elevators. Speciality coffee’s done an excellent job of getting into malls and other high-end Shanghai settings, which, in many western cities, are almost exclusively the preserve of the big chains. A fairly modest set-up in terms of size, there’s a two-part, L-shaped counter tucked away in a nook at the back. On the first part on the counter, a till faces the lobby, while behind it, the long part of the L houses the coffee part of the operation, a two-group La Marzocco Linea espresso machine and its grinders. Opposite this, on the right, is the retail selection, while the street door is at the back. The seating off to the right, where the curving glass wall of the tower lets in plenty of light (and ensures that Mellower is visible from outside). A row of six, small, round two-person tables with plastic bucket chairs follow the line of the wall, while three more, with softer-backed chairs, form a second, inner row, all looking out across the grand sweep of the marbled-floored lobby. As I’ve discovered elsewhere in Shanghai, a lack of size is no barrier to ambition. 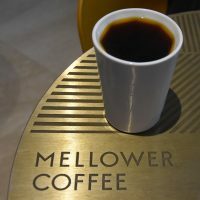 Mellower offers two espresso blends, Sweet Fragrance and Rich Fragrance, and no fewer than nine single-origins on pour-over through the Chemex. Six, including two Chinese-grown coffees, are in the ordinary range, while three are from the more expensive Coffee Finder Series, including one from Yunnan and a Geisha (at 98 RMB a cup!). Naturally, given my quest to explore Chinese coffee, I tried the Coffee Finder Series Enchanting Yunnan. Served in a single takeaway cup (or, in this case, my Therma Cup), I initially classed it as a good, rather than outstanding, cup of coffee, but as it cooled, it grew on me, developing a very pleasing sweetness, another example of the great strides taken by Chinese-grown coffee. This entry was posted in Cafe/Roaster, Cake, Coffee Shops, Evening Opening, Laptop Friendly, Retailers, Saturday Short, Shanghai, Shopping Malls and tagged AroundTheWorld2019, include, Mellower by Brian Williams. Bookmark the permalink.